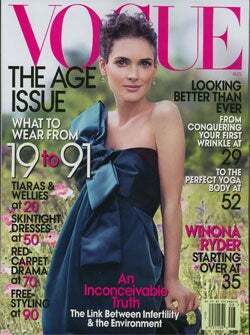 "It took a certain courage for Vanessa Redgrave, Huma Abedin, Robin Brooks and Lisa Randall — among our other age exemplars and serious women all — to admit to the pleasure that fashion brings them," wrote Anna Wintour in the Vogue editor's letter we can't stop vomiting about. Anyway, uh, who's Huma? She's an Arabic-speaking aide to Hillary Clinton who may or may not be dating John Cusack blah blah SO PRETTY AND VAIN AND SUCH PRETTY PRETTY HAIR. Looking through Abedin's closet, you can see the progression from a young college graduate who wore Ann Taylor suits, thrilled to land a job as an intern in the White House, to, eleven years later, a Chanel-wearing, deeply confident 32-year-old woman. Oh, please. Her father is a professor; it's not like she's some oil princess. People in DC wear Ann Taylor suits because they're poor, not because they lack "confidence." She probably makes $100,000 a year and she can't take freebies. And her Birkin bag is a fake. I once saw a movie that spoofed beauty pageants by having a contestant pack a suitcase as her talent. Watching Abedin fill her suitcase for that ten-day trip, I realized the movie had it wrong. Packing is a talent, one Abedin has clearly mastered. (Note to self — folding jacket on the horizontal makes much more sense.) ... Watching her pack also answers a mystery: Those bouncy waves of great-looking hair? Be prepared to carry around a professional hair dryer that weighs at least five pounds.